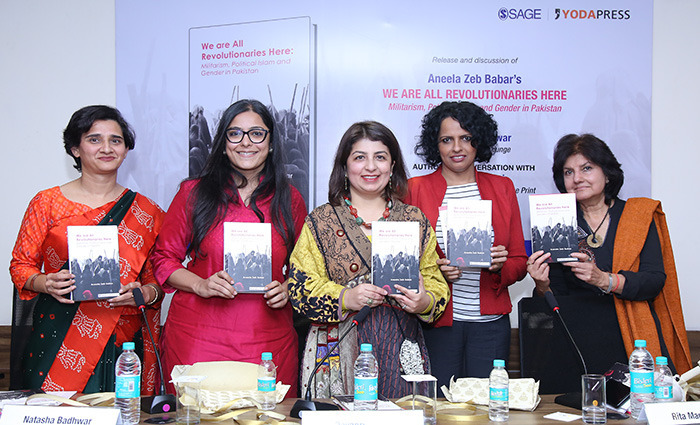 25 January 2018: We Are All Revolutionaries Here by Aneela Zeb Babar, was released in the presence of Ms Natasha Badhwar, Columnist, The Mint Lounge, Prof Rita Manchanda, Research Director, South Asia Forum for Human Rights, Delhi and Ms Devapriya Roy, Author of The Heat and Dust Project at an event held in New Delhi. The release was followed by a panel discussion and fireside chat ‘Author in Conversation’ with Ms Rama Lakshmi, Editor, Opinion & Social Media, The Print on the book. Ms Devapriya Roy, while sharing her experience stated that, “I found this book so interesting and intense that I took it to my classroom to teach my students critical thinking on the subject. While it is a rigorous and muscular work of research, the book situates critical thinking at fertile spot, usually missed by the academicians while teaching and writing about Pakistan and its women." Release of “We are All Revolutionaries Here” by Aneela Zeb Babar in the presence of Ms Natasha Badhwar, Columnist, The Mint Lounge, Ms Devapriya Roy, Author of ‘The Heat and Dust Project’, Ms Rama Lakshmi, Editor, Opinion & Social Media, The Print and Prof Rita Manchanda,Research Director, South Asia Forum for Human Rights, Delhi at an event held in New Delhi. This SAGE YODA title, introduces its readers to an in-depth narrative on Pakistani women and their political participation. The path of this political participation has been traced in the book from the newly created Pakistan in 1947 with more focus on the time span of two decades between 1988 to 2008. Sara Miller McCune founded SAGE Publishing in 1965 to support the dissemination of usable knowledge and educate a global community. SAGE is a leading international provider of innovative, high-quality content publishing more than 1000 journals and over 800 new books each year, spanning a wide range of subject areas. Our growing selection of library products includes archives, data, case studies, and videos. SAGE remains majority owned by our founder, and after her lifetime will become owned by a charitable trust that secures the company’s continued independence. Principal offices are located in Los Angeles, London, New Delhi, Singapore, Washington DC, and Melbourne. In a publishing industry perennially racing to find the holy grail of mass-market success, YODA PRESS strives to explore its niche of the alternative in writing more deeply with each passing year.